THIS is HILARIOUS!!! I would have totally wanted to get it for Phil also. So funny. LOL!!!! Glad you took a picture! This was a classic. 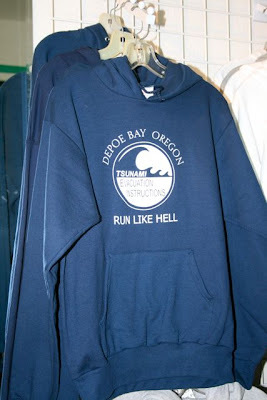 I am such a paranoid when it comes to tsunamis; a sweater like this would describe me perfectly. Love all the pictures. Our family is planning an RV trip into Oregon next September...we may just hit some of these spots you visited. That is funny! I grew up not too far from Depot Bay in Cloverdale OR. My mom and dad still live there. I pray they are far enough inland not to worry about a tsunami. Do you live in Oregon?